SEOUL, SOUTH KOREA--(Korea Newswire) May 23, 2018 -- On May 20, Angeles Oh won the Toastmasters 2018 International Speech Contest at Seoul Women Plaza with a speech titled “How to overcome your weakness Part 2.” He will be representing the Republic of Korea and competing at the 2018 Toastmasters Semi-Final Speech Contest in Chicago, Illinois in August 2018. 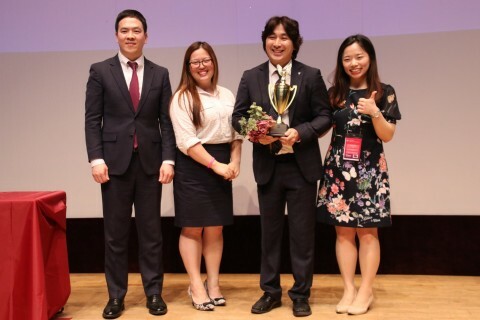 Angeles Oh, along with seven other finalists, survived several rounds of a competition that lasted the past three months including all 1,600 Toastmasters members from all over Korea, which was the largest nationwide speech contest. Contestants delivered five-to-seven-minute speeches on a variety of topics and the results were determined by the judges. Toastmasters International is a worldwide nonprofit educational organization that empowers individuals to become more effective communicators and leaders. Headquartered in Englewood, Colorado, the organization's membership exceeds 352,000 in more than 16,400 clubs in 141 countries. Since 1924, Toastmasters International has helped people from diverse backgrounds become more confident speakers, communicators and leaders. For information about Toastmasters, please visit www.toastmasters.org. Follow @Toastmasters on Twitter.